Anne Sullivan was born in April 1866 in Feeding Hills, a village in western Massachusetts. She was the oldest child of Thomas and Alice Sullivan, immigrants who, like thousands of their countrymen, had left Ireland during the Great Famine. Life in America was not easy for the Sullivan family. When Sullivan was about five years old, she contracted trachoma, an eye disease caused by bacteria. Trachoma usually begins in childhood and causes repeated, painful infections, making the eyes red and swollen. Over time the recurring irritation and scarring of the cornea causes severe vision loss. Anne Sullivan dealt with the effects of trachoma throughout her life. Sullivan’s mother died when Anne was about eight years old. Thomas Sullivan found it too difficult to raise a family by himself and soon abandoned his children. Anne and her younger brother Jimmie were sent to live in the “poor house” in Tewksbury. Conditions at the Tewksbury Almshouse were deplorable. Chronically underfunded, overcrowded and in disrepair, the Almshouse housed an average of 940 men, women and children during the years that Sullivan was there. The mortality rate was very high, and within three months of their arrival, Jimmie Sullivan died. The children had been close, and Sullivan felt the loss deeply. Fortunately, a few people took an interest in Sullivan and gave her opportunities to improve her lot. She underwent eye operations that gave her limited, short-term relief, and she took a trial position as a housemaid that ended unsuccessfully. Early in her stay at Tewksbury, Sullivan learned from a resident who was blind that there were schools for blind children. Realizing that her best hope lay in getting an education, her ambition to go to one of those schools became the central focus of her life. In 1880 Sullivan learned that a commission was coming to investigate the conditions at Tewksbury Almshouse. On the day of their visit, Anne followed them around, waiting for an opportunity to speak. Just as the tour was concluding, she gathered up all of her courage, approached a member of the team of inspectors, and told him that she wanted to go to school. That moment changed her life. On October 7, 1880, Anne Sullivan entered the Perkins Institution. Anne Sullivan’s life experience made her very different from the other students at Perkins. At the age of fourteen, she couldn’t read or even write her name. She had never owned a nightgown or hairbrush, and did not know how to thread a needle. While Sullivan had never attended school, she was wise in the ways of the world, having learned a great deal about life, politics and tragedy at Tewksbury, a side of society unknown even to her teachers. Most of the other girls at Perkins were the sheltered daughters of wealthy merchants or prosperous farmers. Unfortunately, many of Sullivan’s fellow students ridiculed her because of her ignorance and rough manners. Some of her teachers were particularly unsympathetic and impatient. Anne Sullivan’s recollections of her early years at Perkins were mainly of feeling humiliated about her own shortcomings. Her anger and shame fueled a determination to excel in her studies. She was a very bright young woman, and in a very short time she closed the gaps in her academic skills. After the first two years, Sullivan’s life at Perkins became easier. She connected with a few teachers who understood how to reach and challenge her. Mrs. Sophia Hopkins, the house mother of her cottage, was especially warm and understanding. Sullivan became like a daughter to her, spending time at her Cape Cod home during school vacations. She had yet another surgery on her eyes, and this time it improved her vision dramatically. At last she could see well enough to read print. Sullivan befriended Laura Bridgman another remarkable Perkins resident. Fifty years earlier, Bridgman had been the first person who was deafblind to learn language. Sullivan learned the manual alphabet from her, and frequently chatted and read the newspaper to the much older woman. Bridgman could be very demanding, but Sullivan seemed to have more patience with her than did many of the other students. Not much has been written about their friendship, but it’s tempting to think they shared a special affinity because neither completely fit in with the larger Perkins community. Just what her “especial part” would be was not at all clear to Sullivan. She had no family to whom to return, and no qualifications for employment. She feared that she would have to return to Tewksbury. Her joy at graduating was tempered by her fears about the future. Fate intervened in an unexpected way. During the summer of 1886, Captain Keller of Alabama wrote to Perkins director Michael Anagnos, asking him to recommend a teacher for his young daughter Helen, who had been deaf and blind since the age of 19 months. Helen’s mother had read about Laura Bridgman’s education at Perkins in Charles Dickens’ American Notes and began to hope that her own daughter could be reached. The Kellers’ search for help ultimately led to educator Alexander Graham Bell, who recommended that the Kellers contact Anagnos at Perkins School for the Blind. Having long admired Sullivan’s intelligence and indomitable determination, Anagnos immediately thought of her as the best candidate to teach the seven-year-old girl. Although a bit intimidated by the challenge, Sullivan knew this was just the opportunity she needed. She spent the next few months studying the reports of Laura Bridgman’s education by Howe and her other teachers. In March of 1887 she left for Tuscumbia, Alabama, to begin a new chapter in her life. Much has been written about the day Helen Keller and Anne Sullivan first met, and of how the teacher finally helped her student break out of her dark and silent world. The methods Sullivan used when she began teaching Helen were very much like those Dr. Howe employed with Laura Bridgman. They followed a strict schedule and new vocabulary words were introduced in a formal lesson. It was not long before Sullivan realized that the rigid routine did not suit her exuberant and spontaneous young pupil. Never one to be limited by rules, Sullivan abandoned the prescribed schedule and shifted the focus of her teaching. Sullivan decided to enter Helen’s world, follow her interests and add language and vocabulary to those activities. She observed that Helen’s infant cousin learned language by being spoken to, and talked to the girl constantly by fingerspelling into her hand. In her letters to Mrs. Hopkins, she discussed the reasons for her change in approach. I am convinced that the time spent by the teacher in digging out of the child what she has put into him, for the sake of satisfying herself that it has taken root, is so much time thrown away. It’s much better, I think, to assume the child is doing his part, and that the seed you have sown will bear fruit in due time. It’s only fair to the child, anyhow, and it saves you unnecessary trouble. Helen flourished under Sullivan’s creative approach to teaching, and her thirst for information seemed unquenchable. Remarkably, within six months she learned 575 words, “multiplication tables as high as five and the Braille system.” Although Sullivan was a brilliant and intuitive teacher who had moved well beyond earlier rigid prescriptive teaching methods, she continued to seek and receive support and advice from Anagnos and others at Perkins. Home schooling had created a wonderful foundation for Helen’s education, but Sullivan felt impeded by the isolation and limited materials available in Tuscumbia. She decided it would be best for Helen to bring her to the educationally rich environment of Perkins School for the Blind. Perkins’ role in the education of Helen Keller has always been steeped in controversy. Even before she arrived on the Boston campus, Helen had been the central subject of Perkins’ Annual Report. Director Michael Anagnos had drawn from Sullivan’s many letters and reports on her prodigy’s progress and embellished them with his florid prose. Sullivan hated the exaggeration and worried that it might create unrealistically high expectations of Helen that could harm her. After Helen and Anne arrived on campus, the tensions only increased. The Perkins resources were wonderful, but Sullivan disliked her loss of independence. The pair’s relationship with Director Anagnos and Perkins was alternately warm and strained for several years. Keller and Sullivan sometimes lived for long periods at the school and sometimes stayed in Alabama. In 1891, Helen was accused of plagiarizing a story she wrote for Anagnos’ birthday, leading to investigative interviews that deeply wounded the student and her teacher. The strained relationship with Perkins was finally severed when Helen wrote an autobiographical magazine article for Youth’s Companion that pointedly failed to even mention the school. Although Keller and Sullivan maintained friendships with several people from Perkins, for many years they did not have any official interactions with the school. Ironically, though Anne Sullivan never returned to the Perkins campus, her influence at the school is significant. Her skills as a teacher are still deeply respected. 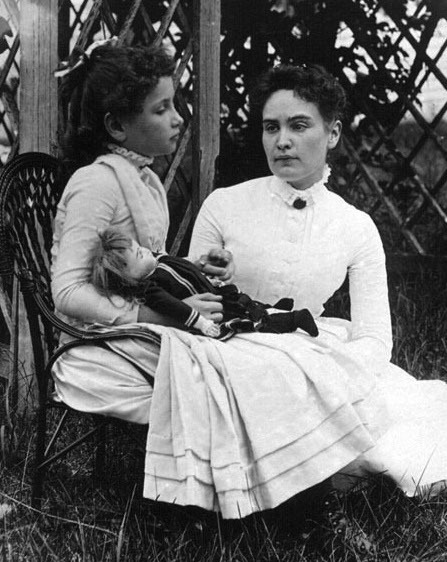 No other individuals have had a greater influence on the education of children who are deafblind than Anne Sullivan and Helen Keller. No school in the United States has educated more children who are deafblind than Perkins. Sullivan’s child-centered methods are the centerpiece of the educational philosophy of the Perkins Deafblind Program. I shall never be able to express my grateful indebtedness to the Massachusetts School…. Best of all, the teacher who has been the light and the beauty of my life graduated from the Perkins Institution, and it was Mr. Anagnos who sent her to me. Surely, words are inadequate for such sacred and far-reaching associations. Helen Keller finally returned to the Perkins campus in 1956 to participate in the dedication ceremonies for the Deafblind Program’s Keller-Sullivan Cottage. Her visit kindled warm relationships with many at Perkins that she enjoyed throughout the rest of her life. Both Keller and Sullivan are revered at Perkins. Helen Keller has served as an inspiration for what is possible for young people who are deafblind; Anne Sullivan has served as an inspiration for the teachers who help these students achieve their potential. Perkins School for the Blind is proud and grateful to have contributed to the education of the great humanitarian Helen Keller and her brilliant teacher Anne Sullivan. McGinnity, B.L., Seymour-Ford, J. and Andries, K.J. (2004) Anne Sullivan. Perkins History Museum, Perkins School for the Blind, Watertown, MA. Hello and thank you for having this article! I do know that Anne Sullivan had siblings other than Jimmy–is there any way to find out what happened to them? Did Anne try to reach out to them in any way as she and Helen did spend considerable time in Massachusetts? We can only find reference to one sibling (see https://www.findagrave.com/memorial/659 for example), but perhaps The Perkins School for the Blind website can help http://www.perkins.org/history/archives/helen-keller-and-anne-sullivan-collections will know more.